With 2.25 billion cups consumed every day and 170 billion dollars spent on it annually, coffee is one of the world’s most culturally and economically important agricultural commodities. We take our morning cup of coffee for granted, but getting that cup to each household, office or coffee shop is the product of constant massive and global efforts and energy inputs. And getting to where we are today has not been that easy either. The seminar will describe how coffee went from being a wild shrub in Western Ethiopia to become a global agricultural juggernaut, directly involving 25 million producers and providing the main source of income for an estimated 100 million people worldwide. An overview of the energy that it takes to grow coffee trees in tropical countries, and then export and process their seeds (beans) all over the world will be also presented. Finally, a seminar focusing on the energy of coffee would not be complete without a discussion of the energy boost caused by caffeine that so many depend on each morning. The Center for Coffee Research & Education (CCRE) was established in September 2016 as part of the Norman Borlaug Institute for International Agriculture at Texas A&M University. With the mission to improve the quality and supply of coffee globally through research and capacity building, the CCRE is dedicated solely to undertaking research and capacity building in coffee. To meet these goals, the CCRE is actively researching ways to support and increase the production of high-quality coffee through its initiatives, while leading the effort to provide education and training opportunities to students and industry professionals of all levels and fields of study. Dr. Leonardo Lombardini received a Laurea degree (equivalent to B.S. + M.S.) in Forestry from the Università degli Studi di Firenze, Italy, in 1993. In 1999, he received a Ph.D. in Horticulture from Michigan State University. From 1999 until 2002, he held a postdoctoral position at the Washington State University Tree Fruit Research and Extension Center in Wenatchee, where he investigated the responses of the application of horticultural practices, such as pruning, deficit irrigation, and application of plant bioregulators on whole-canopy carbon assimilation rate, light interception, water relations, and fruit quality in apple and pear trees. In June 2002, he started his appointment as an Assistant Professor in the Department of Horticultural Sciences at Texas A&M University as a horticulturist/pecan physiologist. He was promoted to Associate Professor in 2008 and to Professor in 2015. Dr. Lombardini’s research focuses on plant physiology, especially in relation to gas exchange and plant responses to environmental stress. He has authored/coauthored over 40 refereed publications, generated over $1 million in grants, and given over 100 presentations at professional and research meetings. He teaches both undergraduate and graduate course in areas of plant physiology and global issues in horticulture. In January 2014 he became affiliated with the Borlaug Institute for International Agriculture as Deputy Director of World Coffee Research (WCR). 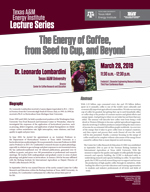 In September 2016 he was named Director of the newly created Center for Coffee Research and Education within the Borlaug Institute at Texas A&M University. As an Italian, Dr. Lombardini’s enthusiasm for coffee has always been part of his life.